As an industry which is ever changing and dynamic, fashion can be a hard market to break in to for a new business. However, you’ll find that if you execute your start up correctly and keep in mind some key tips you will have a great chance at success. With a value of £43.2 billion annually, the UK fashion industry in particular can be an extremely lucrative market to tap in to. Many prospective brands then aim for the European market with it’s value of £411 billion. 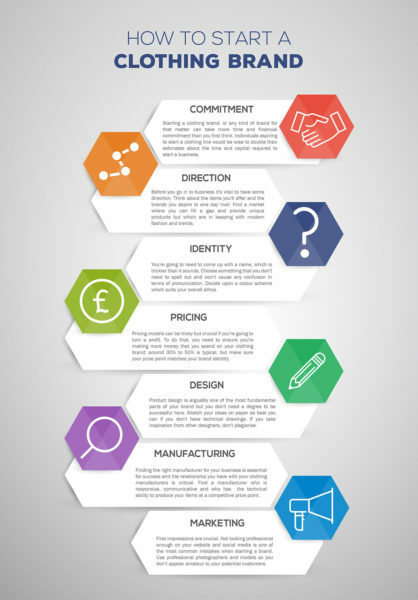 Below is an infographic which explains the key steps involved in creating a clothing brand. You can find more information about each step in the guide here. For more helpful guides and advice, you can look at the resources available from Hawthorn.